KJIPUKTUK (Halifax) -- The Halifax Media Co-op has been provided with a copy of a communication sent from the Mi'kmaq community of Sipekne'katik First Nation to Nova Scotia Premier Stephen McNeil, along with representatives of Alton Gas. In the letter, Chief Rufus Copage of Sipekne'katik outlines that despite today, January 18th, being the government's determined final day for First Nations groups in the province to submit concerns related to the proposed 'Alton Gas Caverns' project, he, along with Chief and Council from Millbrook First Nation, as well as the Sipekne'katik district Grand Council, do not in any way perceive that the government's consultation efforts on the proposed project are finished. In the letter, Copage also notes that his community members, as well as community members from Millbrook First Nation will be going to a full referendum on the issue. Recently a meeting was held on Friday, January 8th, 2016, between the councils of the Sipekne'katik and Millbrook First Nations, along with representatives of the Sipekne'katik district Mi'kmaq Grand Council to discuss the Alton Gas issue. Prior to any final decision being made regarding this controversial matter, both First Nations of the Sipekne'katik district are united in demanding substantial, ongoing and satisfactory communication with our membership. Additionally, there must be extensive engagement by Alton Gas and the appropriate regulatory bodies with our respective communities on the proposed project. Throughout this, the province must uphold the honour of the Crown as it meets its fiduciary duty that is owed to the Mi'kmaq. Once these real and meaningful processes have been completed, each band will hold a referendum on whether band members agree or disagree with the project proceeding. The province will be notified of the result of our community votes. The project, by which waters from the Shubenacadie River will be used to 'hollow out' nearby 'salt caverns', which will then be used for natural gas storage, has met with significant resistance from nearby communities, First Nation and non-Indigenous alike. In the fall of 2014, as work on the proposed site intensified, locals maintained a protest camp along highway 102, one of the main East-West corridors in Nova Scotia. Concerns over the project are varied. Firstly, there is the well-founded risk that similar 'hollowed-out' caverns - when used for storing natural gas - are unpredictable as far as storage containers go, and they, along with the pipelines that link them, can and do result in massive explosions and fires. Pragmatically, real estate values of properties near to fossil fuel-related accidents experience significant reductions in value. Recent studies have found that even the “reputational impacts alone are significant”. Simply living beside a potentially explosive series of gas caverns is enough to drive down the price of homes. 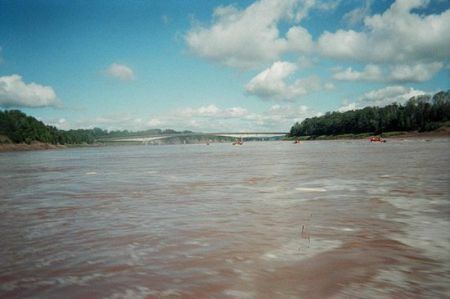 There is also the unknown risk related to re-introducing tens of thousands of litres of salty, or 'brine', water from the 'hollowed' caverns back into the Shubenacadie River system. The Shubenacadie remains a vital breeding ground for a variety of species, including the Striped Bass. “I think that Sipekne'katik and Millbrook have taken great leadership on this issue,” says Sipekne'katik councillor Cheryl Maloney. “They've recognized that this is something beyond their mandate as just being Indian Act chiefs, that they need to go to their members on this issue, and in this case hold a referendum. I think they made the right decision, calling for a referendum of their people, because it's beyond the role of Indian Act chiefs to go and infringe the rights of the Mi'kmaq people without their consent. Submitted by chief wiggam on Thu, 01/21/2016 - 14:17.
. the shubie chief talks one way and then does an about face. he talks from 2 sides of his mouth. he himself voted yes. with him you never know. just like any other politician. the majority of native bands approved it. so why is the tail wagging the dog.